Rob Fairhead of Network Rail showing a Cambridge Cycling Campaign open meeting a computer generated image of Cambridge station with its new island platform. .
On the first Tuesday of every month the Cambridge Cycling Campaign hold an open meeting, usually at the Friends Meeting House. 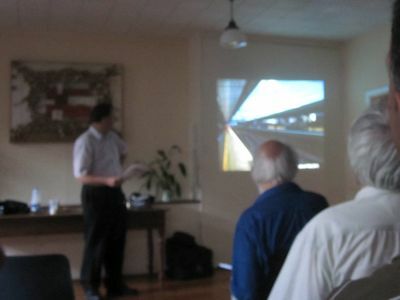 I attended the July 2010 event where Rob Fairhead and Alison Clark from Network Rail gave a presentation about the proposed new “Island Platform” at Cambridge station. The new island platform will allow more 12 coach trains to be run between Cambridge and London. The new platform is to be accessed by a footbridge. The bridge is to have stairs and a small lift which bikes will struggle to fit in. Members of the Cambridge Cycling Campaign are unhappy that Network Rail, by their own admission, did not consider the special nature of Cambridge station with its large number of cyclists. The new platform might provide a stepping stone to a new eastern access. Network Rail are keen to experiment with double-decker cycle racks at Cambridge station as an immediate solution to the bike parking problem. Cambridge will be connected, via Thameslink, to the continent, by 2016. Trains from Cambridge to Paris are not promised but the possibility of them appears to be getting closer. The presentation to the Cycling Campaign meeting was held following a similar, private, briefing the company had given city councillors the week before. A number of City Councillors, (Rosenstiel, Brown, Pogonowski and Howell) attended both briefings. Councillors, a number of whom are members of the campaign, commented saying they were present both to hear the views of members of the cycling campaign and just in-case the two presentations were different. The presentation started with some history. We were told that proposals to expand Cambridge station had been prepared in 2006, as part of a scheme to introduce a high frequency rail shuttle service between a relocated Waterbeach station and Addenbrookes. While that scheme didn’t go forward some of the plans remained available to be utilised. Mr Fairhead was asked if the new island platform proposal was potentially subject to public sector cuts. He responded to say: “No”. He explained that a complete rejig of the current access charges and Network Rail’s five year plan would be needed in order to cancel the scheme, and as such it had a 99.9% chance of going ahead. The new platform will take 12 coach trains, and enable more 12 coach trains to be run to London. As currently trains would run full length only between Cambridge and London and would operate with fewer carriages to the north. We were told it would relieve congestion and overcrowding in rush times and would enable the separation of North and South bound traffic. At the moment Cambridge is the bottleneck on routes through it, with the two new platforms (on either side of the island) the constraints on the rail network would move elsewhere. New services would be possible, for example a half hourly Birmingham to Cambridge cross country train. Currently safety time-outs (two minutes) on the points cause extra journey time with trains waiting out on tracks away from the platform waiting to get in. The “scissors” points arrangements in-front of platform 1 at Cambridge which allows different trains to get to, and leave from, the adjacent platforms 1 and 4 was described as “not seen much in the UK network” but we were told there are “lots in Europe”. The platform will be built on space currently occupied by two freight tracks; the island will be 9m wide. The footbridge to the new island platform will be enclosed, and dry, it will be accessed by 3.3m wide stairs. The footbridge will be to the left as you exit the ticket hall, its presence will result in platform 6 being shortened by a few metres (but if needed space is available for platform 6 to be extended further away from the station). If the same timetable as is currently used (but with more 12 coach trains) the island platform would only need to be used in rush hour, however operators may use it to avoid conflicts. For example it could speed up access to Stansted airport from the north as currently trains are timetabled to take 7-8 minutes to get through Cambridge. A full re-design of Cambridge station, moving the tracks and signals is at least a decade away. It was last done in 1982. This isn’t a “re-signalling”, its “just” a replacement of two tracks with a new platform. A “St. Ives to Paris” service was noted to have been something pro rail and anti guided-bus group “Cast Iron” had used in their campaign. Connecting Cambridge to the channel tunnel and continental Europe was discussed in relation to a connection with Thameslink – using a tunnel which already exists but in which track has not been laid. Thameslink – Cambridge connection is being “assumed” to be in place by 2016. New “super fast” trains area also proposed though it is not yet determined if they will go only as far as Letchworth or if they will come to Cambridge. (I think getting the fast trains to Cambridge is something Cambridge’s MP ought be lobbying for). We were told that “as of today the Thameslink related work is funded”. Campaign members noted that Cambridge’s unique situation with respect to high levels of cycle usage had not been considered when designing the bridge. They pointed out that a proposed lift was too small to comfortably take a bike (a typical bike could only be put in diagonally). “Guttering” to make it possible to roll bikes up the stairs was suggested and discussed. Those present pushed the question of “guttering” – a track to wheel your bike up – along side the stairs. As a non-structural change this was something which the Network Rail reps said they would be able to look into. The guttering wasn’t presented as an ideal option though, more as a way of mitigating the effect of the failure to specify a decent sized lift or appropriate ramps. It was questioned if a gutter would be permitted under the Disability Discrimination Act on the grounds that it made access to, and use of a handrail harder and might necessitate the removal of a lower handrail which the questioner said was now compulsory. An assurance that Network Rail would consult closely with the Cambridge Cycling Campaign over the detailed design of any gutter and handrail was given. Members of the campaign noted examples present in other stations and Mr Fairhead said he would go and see them. Cllr Adam Pogonowski suggested an escalator, with a special “non-step” section onto which a bike could be wheeled. He was told this wasn’t practical due to the late stage in the design process and the fact the space under the stairs was already earmarked to be used for the lift machinery. The reason for having the lift machinery under the stairs is to keep the profile of the new bridge low and prevent it having too much impact on the appearance of the station from the front. (Personally I’d prefer functional and elegant design and I’m not too fussed about preserving existing appearances and views in this utilitarian area). Martin Lucas-Smith asked for some detail on exactly what was proposed, including what the dimensions of the lift were, so that those in the room who had not already been involved in campaigning on the subject could be brought up-to-speed. We were then told the lift was to be a square with sides 1.6m in length, giving a diameter of 2.25m. It was noted that the average bike was 1.8m long so would not fit straight in, but would need to go in diagonally. Mr Fairhead said that the lift complies with regulations intended to make sure it was large enough for wheelchair users and it could comfortably carry “The Department for Transport’s regulation wheelchair”. It was pointed out to Mr Fairhead that placing a bike diagonally in the lift would be likely to upset other lift users. Campaign members joined in to share their personal experience reporting that in practice such behaviour, understandably, did annoy others especially people who might be penned in behind the bike in the lift. Having been distracted from the main thread of the presentation by discussion of the lift for some time the presentation returned to the prepared slides. We were told that the new platform would “not be minimal” and it would have the same “look and feel” as the existing platform. There will be a coffee shop there from day one, and more facilities, such as toilets, could be added in the future. The potential for road access from the East; so that people dropping others off at the station had a wider range of options was discussed. Network rail said there was existing road access to the tracks near the toilet emptier and carriage washer. Work on this area is scheduled for May / November 2011 during weekend daytimes. Others may have grasped the detail of what is proposed better than I did, but I think the idea is to move the facilities, creating more land at the edge of the railway without tracks on it, the primary motive for this from Network Rail’s point of view would be to release land for development (they said they were keen to release the value of the land), but there would need to be master-planning with Cambridge City Council and the possibility of an access to the station is there. The island platform was described as a potential “first link” to an eastern access to the station. Giving an interesting insight into the way Network Rail runs, essentially as part of the Government, we were told that it would be up to the Department for Transport, and not Network Rail, to decide if the land to the eastern side of the tracks was needed for provision of the rail services. We were told a key meeting to discuss “if the Government has requirements” was to be held the week following the presentation to the cycling campaign. I would like to see Cambridge’s MP ensure he, and the Cambridge public are kept informed of the Government’s position with respect to selling off land near Cambridge station so representations can be made if necessary. We don’t want to see a quick “profit” for a here today gone tomorrow “company” at the expense of flexibility for the future of Cambridge’s key transport interchanges. The fact that some land is currently “open green space” was noted and it was suggested that Network Rail ought do something with it before the local residents get too fond of it and might want it kept – making establishment of a new access harder. The potential for a walking / cycle access from near the mini-roundabout on Rustat Road was what was being discussed. Mr Fairhead said that the position on potential new access routes to the station was much as discussed in the cycling campaign’s newsletter 42 produced in June/July 2002. Mr Fairhead said that he found the cartoon which accompanied his quote in the Cycling Campaign’s newsletter funny and well deserved. Cycling Campaign member Simon Nuttall described Network Rail as being “on a different planet”. He was complaining about them: “designing a footbridge which doesn’t accept cycles” and specifying a lift which would only take one bike at a time. Exasperated he asked: “How has this happened”. Mr Fairhead responded to say that Network Rail’s design decisions had been made under pressure. Those present made further comments on the proposed bridge. One expressed concern that there might be an “unfortunate accident” involving users of Brompton bikes. The rationale behind this statement wasn’t explained and the concern didn’t appear to be widely shared . Another person predicted cyclists getting off trains on the island platform and queuing up to get up the stairs. Cycle congestion was specifically anticipated with the first train either end of the period during which carrying bikes on trains is banned during rush hour. Mr Fairhead said; “there is understandable concern and anger, I am not standing up here and defending it”. 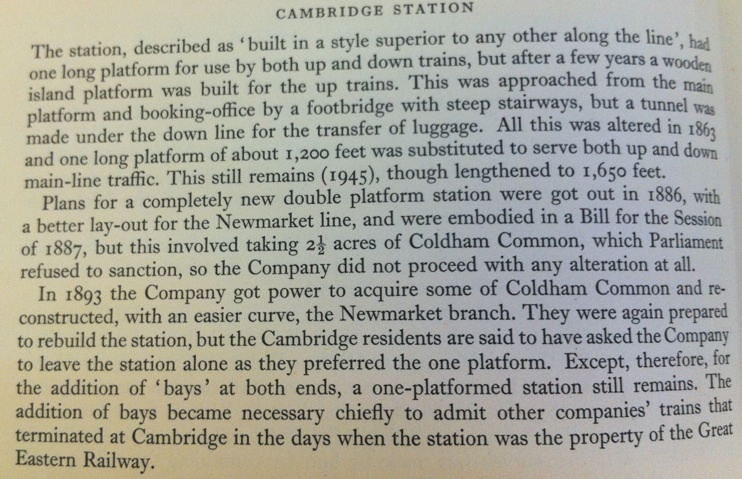 It was pointed out that it was not only cyclists who had a demand for a decent sized lift (or ramped access to the bridge), many people with wheeled luggage use Cambridge Station, for example students, tourists, and those travelling via Stansted Airport. It was noted that planning / listed building permission will be needed for the new bridge. It may be worth objecting on the grounds of the lift being too small, and negating the utility of the proposed development, though quite if councillors would be able and willing to reject the application, or impose conditions requiring a bigger lift. Even if councillors don’t feel they are in a position to reject the planning application I think they, and Cambridge’s MP, ought to put pressure on Network Rail to revisit their bridge designs. I have not noticed a planning application yet. A bridge at the Hills Road end of the station was suggested, where there might be more room to create large, gently sloping ramps. Mr Fairhead said that a footbridge from the Cambridge Leisure site still had planning permission, but that was proposed to land outside the station, and not on the island platform. The question of who is to pay for the new cycle park proposed as part of the CB1 development was discussed. The group was told that while it was “part of the CB1 development” it relied on money put in by the City Council. David Earl asked if it would be possible to link to the new bridge directly from the first floor level of the proposed new multi-story cycle park. Mr Fairhead said while it might be structurally relatively straightforward there would be a challenge relating to the “paid and unpaid areas” needing a staffed barrier. When those present suggested staffing wasn’t necessary as those needing assistance wouldn’t have far to go to the main ticket hall we were told Network Rail does not allow unstaffed barriers. Mr Fairhead suggested that was the kind of thing that a potential new franchisee might include in a bid. Jim Chisholm noted a potential cycle and pedestrian access route under Mill Road bridge was currently blocked by the presence of equipment related to electric trains. He suggested that if the electric had to be turned off and adjusted when the footbridge was put into place then that might be an opportune moment to also move the equipment from under the bridge. He suggested opening up access from Mill Road bridge, letting people cycle to the station without having to cycle on Devonshire Road (where parked cars mean there is little space for a bike and car to pass). Chisholm Trail page on the Cycling Campaign website including a clearer map. Mr Fairhead was encouraging on the subject of access from Mill Road, he said that the mindset within Network Rail had changed and they were now quite pro people having more access to, and along, railway land as they had found that the presence of paths and cycle routes reduced vandalism and graffiti of their trains and property. The suggestion of installing double deck cycle parking as seen in London Liverpool Street was raised. Various alternative formats two-layer racks were debated. There was some concern people would find them difficult to operate, but Network Rail appeared very open to the idea of installing some different rack types as a trial to see if they would get used. Their representatives promised to pursue the idea. Martin Lucas-Smith suggested switching some car parking spaces to cycle parking. He said the cost of a car park space was clear – it was £1,500 / year but there was no one putting a value on the cycle parking. He made a suggestion that Cycle Cambridge (the bit of the County Council which details with the Cycling Demonstration Town improvements) ought to “buy out” the spaces as a way of forcing the issue, i.e. pay the cost of the lost revenue that the train company would have received from car parking and pay for the installation of stands. I got the impression that an alternative option to achieve the same aim might be for the Department for Transport to say that they don’t need or want the funds raised from the car parking spaces and make clear they would prefer some of land to be used for cycle parking, and adjust Network Rail’s public funding by the consequent, negligible, amount. There was a brief discussion of Chesterton Station, with the suggestion that opening would reduce the demand for car parking in Cambridge. Those present asked why a simple “Waterbeach style” station couldn’t be installed very rapidly at Chesterton, with someone pointing to the fact a new station in Workington was put up in six days following floods. Network rail’s response was that in Chesterton there are freight tracks and freight trains in the way, the land is contaminated, and the Disability Discrimination Act created challenges. Those present jokingly queried if those barriers would disappear if “we managed to flood Cambridge Station”. This entry was tagged Cambridge, Transport on July 22, 2010 by Richard Taylor. Totally amazing that they didn’t think about bikes – what planet are these guys on. I take it there was no mention of reinstating the existing tunnel that apparently goes under the tracks from when there used to be an island platform before? No, no mention of any tunnel or any historic island platform – do tell us about it! I was chatting to one of the rail guys one day and he told me that an old tunnel still exists and apparently is now only accessible from a hatch in the ticketing hall. Seeing, from your comment, that Network rail seem not to be aware of bikes in Cambridge then its probably not to surprising that the existence of the tunnel is not known by the powers that be! Geoff Jones posted an photo of a section of a book (Cambridge Antiquarian Society 1949) containing a section describing a tunnel for luggage which connected the ticket hall with a previous wooden island platform. The snippet on Geoff’s site also caught a section saying train companies were forbidden from picking up or dropping off Cambridge University students other than at specified stops on the line. That excerpt also contains some odd rules relating specifically to University of Cambridge students. It is an example of a bike ramp at the side of a staircase from the Bay Area Rapid Transit system in California. I believe the land development Network Rail were discussing is known as the Rustat Gap. I know that in Coleridge Labour were campaigning against development there during the recent elections, because of concerns about congestion and parking. Whilst there are obvious grounds for allowing access to the station from both sides, this is going to require an awful lot of thought to do properly. If there’s an entrance there, then there will be cars there and right now there just isn’t room for dedicated car parking, which means Rustat Road will get even more crowded with commuters parking there. I have a sneaking suspicion that Network Rail know this and aren’t seriously looking at making a second entrance. We’ll just get yet another block of flats with insufficient public space. Those bikes that fold up are the easiest thing to carry around with your on public transport but they are expensive. Presumably the tunnel is a bit like the really good and easy to use with a bike or heavy luggage tunnel at Ely? Having had to change trains at Stevenage once with a heavy suitcase, and the place being full of people similarly encumbered, I’d have missed my connection if I’d waited for the lift. Why should the disabled be forced to wait for a lift if they are able to negotiate a ramp. On my last visit to Cambridge Station I’d say 30% of people either had luggage, a pushchair, or some other kind of lack of ability to use stairs. But it’s a bit like there only being one ticket barrier wide enough for all those classes of passenger. Network Rail are only interested in season ticket holders who are the real cash cows of the railways, despite the dreadful conditions they endure. Interesting discussion. So, this tunnel and island platform was only in operation from 1848-1863… I very much doubt the presumably very small tunnel is a place you would want to send your luggage down now! I forsee lots of hassle here as people leaving/arriving bikes struggle.